Tomorrow's Rainbow Charity Presents Digory and Duchess' Anniversary Celebration! COCONUT CREEK, FL--(Marketwire - May 1, 2008) - Tomorrow's Rainbow's Donkey Wedding Anniversary Celebration will benefit children's grief support programs at the Tomorrow's Rainbow Ranch. Community support is essential to the continued success of this innovative program that combines facilitated peer support groups with miniature horse and donkey interactions and therapeutic play. Last year, Tomorrow's Rainbow, www.tomorrowsrainbow.org, celebrated the wedding of two of their beloved team members, Digory and Duchess, with over 300 of our closest friends, family and members of the media. 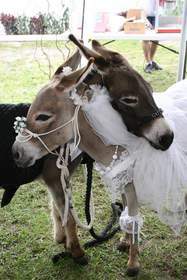 On Sunday, May 4th, from 2:00 to 5:00 PM, please join us in celebrating the one year anniversary of their wedded bliss at the Tomorrow's Rainbow Ranch in Coconut Creek, FL. There will be food, music, a pony parade and obstacle course as well as an arts & crafts center... and meet the KIDS! Tickets can be purchased online, www.tomorrowsrainbow.org, or at the gate.